XDCAM HD422 and "Invalid Track Layout for Asset"
Graeme Robinson replied the topic: XDCAM HD422 and "Invalid Track Layout for Asset"
I can't find anything wrong with that file, and I can convert projects that use it here. It appears to be used on an inactive angle of a multicam clip. Are you able to just remove that angle from the project if it's not being used? The multicam clip is at 10:01:03:10 and is called "Final prep draw order 10" and the angle that uses this clip is called "XF". Perhaps if you removed the whole XF angle from that multicam clip, that might let you work around the error. slickslack replied the topic: XDCAM HD422 and "Invalid Track Layout for Asset"
Any progress on the file I uploaded? Jeremy Norwood replied the topic: XDCAM HD422 and "Invalid Track Layout for Asset"
I got an error when importing the XML to FCPX (see screenshot attached) but it imports and looks all right. And I got the same error as before when trying to Export from X2Pro. What's the easiest way to get you that mxf file? It's just over 2GB. Dropbox? Last Edit: 3 years 8 months ago by slickslack. Try using the attached XML and see if it works for you. If not, we may need to get the file "AA848301.mxf" from you. I would hazard a guess that the file itself is what is causing this, not the XML. I can try to send you a video file of the sort that seems to be causing this. Are you running the latest released version of X2Pro from the App store? The latest version is 2.5.1. Check your X2Pro version and update it if possible. I tried converting your XML and it converts for me. Alright, I'm back in front of this project. 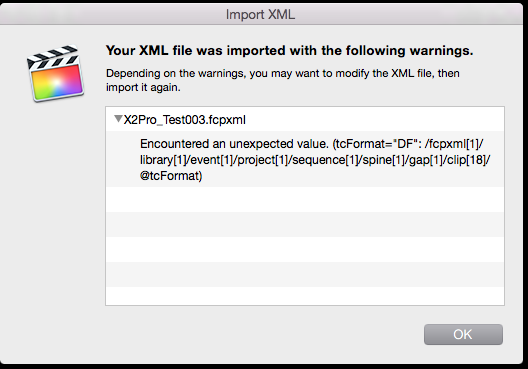 When you get back to the project and still get an error if you can send me the FCP XML and the full text from the X2Pro error that you get, it will definitely help expedite the process. Phew, I was beginning to think I'd been forgotten. I am not currently in front of that project right now and I won't be for a couple of weeks. If we can get this to work we'll be getting the upgrade to the full version as we have to push the project through a ProTools finish. I just can't get the $$people to sign off until this workflow has been verified. My apologies for the extremely delayed response. I tried converting your FCPXML that you did give us, and it is working on my computer; and I believe you said you did get it working there. 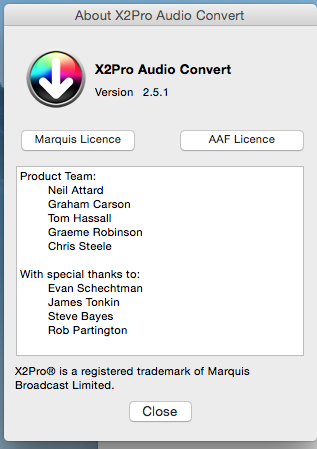 In general, X2Pro does support converting projects that contain mxf files. 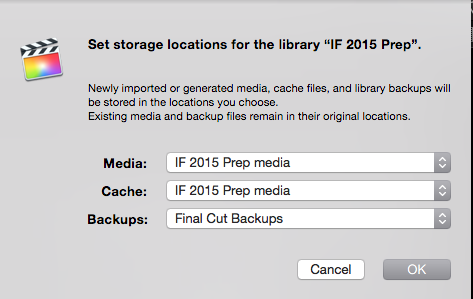 In fact, the fcpxml that you gave us does convert even though it uses 13 mxf files. If you are still see or are getting an error message of "Invalid track layout", then we will need to get an fcpxml from you that produces that error. In regards to the differences between X2Pro and X2Pro LE, the comparison chart can be found here . To summarize, X2ProLE is a lower cost version for those who do not need the advanced professional functions of referenced media, trimmed media, or close control of the conversion of roles. Trying to manage expectations on how our post flow might work. It would be great to know if there's any progress or more information on this issue and whether we need to look elsewhere. The "sequence" you mean? We're using test sequences as we're in the early stages of cutting. I hope this is what you mean by configured media locations. Let me know if it's not and I'll get what you need. EDIT: I got an error message saying that the XML was empty so it wouldn't upload. EDIT2: Re-exported and this time it worked. So I am gathering from the silence, that clips that were dragged into FCP X as XDCAM HD MXFs which play fine and can be synched in multi cams etc. CANNOT be exported using X2Pro. If this is something that is different for the Pro version vs the LE version, which I don't believe it is, that would be good to know. I did some more tests today and converted some of the XDCAM to ProRes and relinked it from inside FCPX and the X2PRo exported those with well, not ease, but it eventually did make an AAF. I got a message saying some materiel "had to be modified something something something shot at 24 but edited at 23.976" or some such text. However when I brought the AAF into Logic X the only audio that was in it was the stuff that had been converted to ProRes from the MXF. The other source in the multicam that I used for the test was from RED and that footage was native and none of that material showed up in the AAF. It looks like because of the way this project was started that X2Pro will not be an option and we're looking at dumping out full length AIFF/WAV split up by roles. The other option is to slowly convert all the MXF stuff and somehow relink each library to the ProRes version of each file.